Precast concrete has grown leaps and bounds in the past few decades since the time when we thought that everything that in order for something to be strong, it also needed to be heavy. Since then we’ve learned just how strong, light, and thin that we can make precast concrete without sacrificing anything we had in the past. The biggest key to this transformation has been GFRC or Glass Fiber Reinforced Concrete. Since GFRC first started taking hold in the industry in the 1970’s, the formulas for achieving the most efficient GFRC casting material have changed drastically. In the last few years, SureCrete has pioneered one of the industry’s first “All-In-One” bag mix formula for GFRC. Bontrager Concrete Specialties of Indiana used Surecrete’s hybrid GFRC mix just recently to create some stunning precast pieces to accent a home in Granger, Indiana. They purchase their supplies locally from DC Supply out of Nappanee, Indiana. 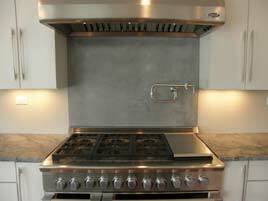 The fireplace surround is 54″ x 78″ and the back splash behind the stove is 48″ x 39″. Both were cast as one solid piece. First they used a pour-able hybrid GFRC mixture from SureCrete called XS Precast Mix for the face of the pieces. 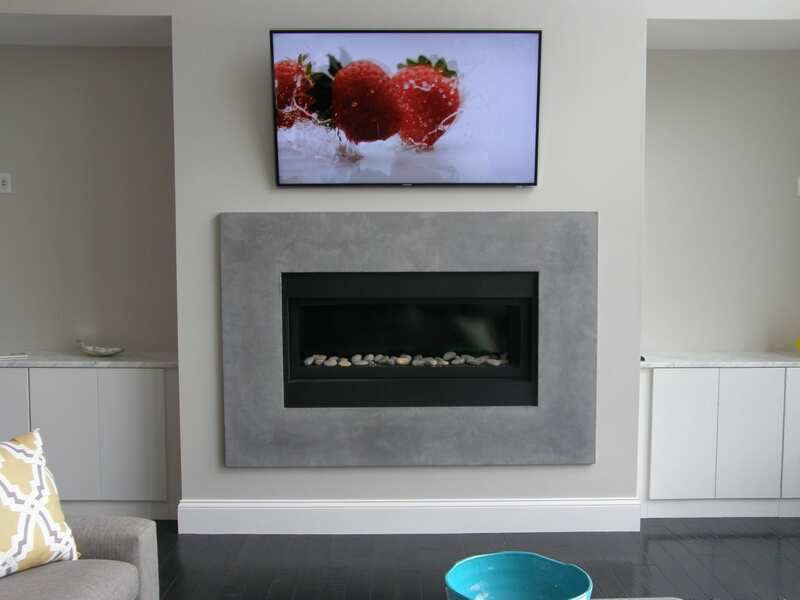 The fireplace surround received a face coat of 3/8″ prior to an application of another lighter weight hybrid GFRC product, bringing the total thickness of the piece to 1″. The total weight of the piece, however, was easily manageable enough to be moved around without equipment, thus eliminating the need to cast pieces on site, and allowing for much more control over their working environment. 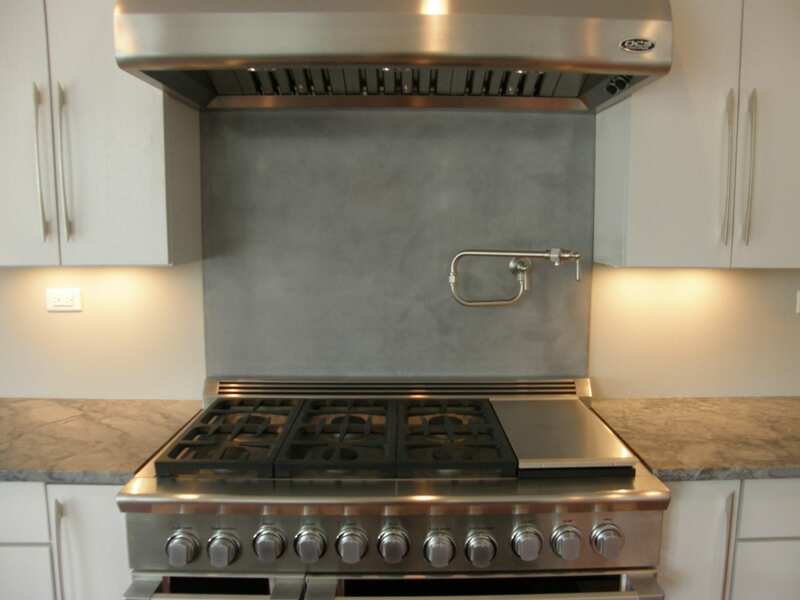 The back splash behind the stove in the kitchen was cast entirely out of SureCrete’s XS Precast Mix at a total thickness of 1/2″. Two color packs were used in the XS Precast Mix in both pieces to create the variegated two-tone color you see. Since the hybrid GFRC mix SureCrete makes is a high quality white-portland cement based product, it is very easy to manipulate the color of the mix integrally as well as being able to accept ecologically friendly stains once they have been taken out of the mold. Another piece of information worth mentioning is that pieces cast using the hybrid GFRC mix called XS Precast Mix can be pulled from their molds within 4-6 hours depending on the environment they are cast in. They also do not create the same exothermic reaction that the vast majority of GFRC Mix Designs currently available on the market do, thus allowing you to simply cast the piece and walk away instead of having to keep eyes and ice on it at any given time to prevent thermal cracking. Once these pieces were de-molded, the staff at Bontrager Concrete Specialties cleaned the pieces and polished them up to a 400 grit, followed by two coats of Surecrete’s XS-327 Hybrid Water Based Polyurethane Sealer. They used a seemingly simple fabrication process to create fantastic original pieces with accuracy and efficiency. Give the staff at DC Supply a call at 574-773-7300 if you’re in the Nappanee, Indiana area and they’ll consult you on how you can save time and money using these amazing products on your next fabrication job.